Up to date, the formation of both O2'- and NO' increases with capacitation whether induced with BSA, progesterone, ultrafiltrates from biological fluids (FCSu, FFu), etc. [40, 46, 55, 56] However, this does not point out to a specific substance as initiator of ROS synthesis. The cell-permeant analog of cAMP, dbcAMP, stimulates NO', but not O2'-, synthesis , presenting cAMP as a possible intracellular modulator of NO' synthesis [46, 56]. NAD(P)H. Interestingly, inhibitors of NADH formation by lactate dehydrogenase C4 (sodium oxamate) and of NADPH synthesis by isocitrate dehydrogenase (sodium oxalomalate) block bull sperm capacitation induced by heparin but not that due to exogenous O. '- (xanthine + xanthine oxidase) [81, 82]. This finding strongly indicates a role for the two enzymes as suppliers of NAD(P)H, for sperm ROS synthesis related to capacitation [81, 82] . On the other hand, exogenous NADPH, which is also a cofactor for NOS, stimulates the generation of NO' but not that of O2'- , which may solve the previous controversy [40, 83] as for the mechanism by which NADPH promotes human sperm capacitation. There is no real opposition between these sets of data because intracellular NAD(P)H formed by dehydrogenases as those mentioned above [81, 82] may act on an NOS in the cytosol, or a transmembrane oxidase with a binding site for NADPH oriented toward the inside of the cell. The actual localization of the ROS generators is still unknown which makes several hypotheses plausible. All together, observations noted above and in the preceding sections raise the possibility that the oxidase and/or the NOS at the sperm membrane level are always in a "switched-on" state and that their action depends on the presence of adsorbed seminal plasma inhibitors. The removal or degradation of these substances would allow the synthesis of ROS and initiation of capacitation. This mechanism is plausible since spermatozoa lose their surface-adsorbed material during their transit in the female genital tract [1, 2, 4, 9]. Seminal plasma contains several factors, including cholesterol [2, 10], phos-phatidylcholine-binding proteins  , glycodelin-S  , to regulate capacitation but, as for now, the main physiological inhibitors for O2'- and NO' generation are probably Zn2+ and semenogelin (Sgl, 52 kDa, and Sgll, 71 and 76 kDa, collectively called Sg in this chapter), these factors being present in seminal plasma at concentrations (Zn'+: 2-5 mM, Sg: 10-20 mg/mL) [86-88] 100-fold higher than those needed to block ROS formation and capacitation [56, 86, 87, 89, 90]. Therefore, Zn2+ and Sg may act as regulators of ROS synthesis and prevent premature development of capacitation and consequent decreased fertility [87, 91]. Zn2+ is of paramount importance for sperm function and chromatin integrity and is found in all sperm compartments . At mM levels, Zn2+ blocks the high ROS formation in spermatozoa from infertile men  and at lower levels (50 mM) Zn2+ inhibits capacitation and associated synthesis of both O2'- and NO' [56, 87]. Conversely, Zn2+ chelators (TPEN, 200 mM; EDTA, 100 mM2 promote these events, but not in the presence of SOD or NOS inhibitors adding again to the idea that Zn2+ plays a central role in ROS synthesis [56, 87]. It is important at this point to stress the interaction between Zn2+ and Sg. Each Sg molecule can bind up to ten Zn2+ [86-88] and Zn2+ promotes the binding of Sg to sperm proteins in cell-free assays . However, the inhibitory effect of Sg in sperm capacitation and ROS synthesis is not due to its adsorbed Zn2+ since it occurs even in the presence of a Zn2+ chelator (TPEN) . The binding of Zn2+ to Sg reduces the amount of nonprotein-bound Zn2+ in seminal plasma to levels low enough that the prostate-specific antigen (PSA) is activated and degrades Sg [86-88]. Regulation of capacitation onset appears as a major role for Sg. 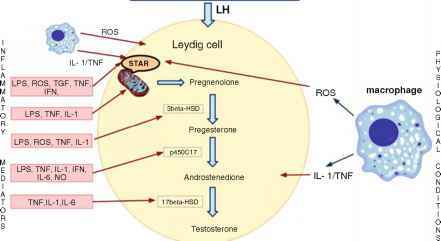 In vitro, Sg, as well as its degradation peptides, blocks sperm capacitation triggered by various stimuli (FCSu, l-Arg, BSA, etc. ), an effect that is reversed by the exogenous addition of both O2'- (xanthine+xanthine oxidase) and NO' (DA-NONOate) [86,89,90], As expected, Sg completely blocks O2'- and NO' formation [86, 89, 90]. Sg and its degradation peptides may also have other effects on spermatozoa (activation of hyaluronidase, inhibition of movement, antibacterial activity, hyperpolarization of plasma membranes, binding to heparin, eppin, and fibronectin, etc.) as reviewed before [86, 88, 95] without relation to capacitation. Surprisingly, spermatozoa not only bind [86, 88, 95], but also internalize  Sg. 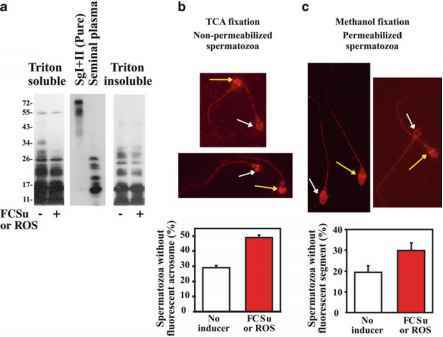 Sg and its degradation peptides are present in Triton-soluble and -insoluble sperm fractions, as well as on the sperm head (without or with permeabilization)  . In all cases, Sg levels decrease with incubation with FCSu as capacitation inducer (Fig. 4.5). Other conditions that promote capacitation (exogenous O2'- + NO' or Zn2+ chelator) reproduce these effects and, conversely, the combination of SOD and NOS inhibitors, or Zn2+, prevents the drop in Sg and its degradation peptides present in sperm fractions . Furthermore, Sg degradation in sperm fractions is Zn2+ inhib-itable , The very basic isoelectric point of Sg (pi 9.5) [86, 88] and the high content of acidic (often sialylated) proteins on sperm surface  may be compared to the interaction between cationic peptides and highly negatively charged membrane of bacteria which leads to internalization of these peptides . However, the mechanism by which Sg passes sperm membrane still needs to be proven. minute amounts of ROS is not known. The two options are plausible  and could prevail in spermatozoa to warrant a sure initiation and progression of capacitation. ROS synthesis [56, 101] and is also expected to cause the removal of Zn'+ from proteins [98-100]. Whether this occurs in spermatozoa is still not proven. The low levels of Zn2+ measured in incubation media are not significantly different whether spermatozoa are incubated in control or capacitating conditions (unpublished data). This may indicate that our hypothesis is not valid or that Zn2+ is immediately shuttled to other proteins [98, 100]. Nevertheless, as in the preceding discussion, whether Zn2+ is released before ROS are formed or ROS cause the release of Zn'+ is not known and the two possibilities are valid and may be concrete and needed to assure that capacitation occurs. As said above, the oxidase involved during capacitation appears to act upstream of the transduction cascades known to be involved in this process. None of the inhibitors tested for PKA, PKC, PI3K (phosphoinositide 3-kinase), Akt (protein kinase B), ERK pathway, and PTK had any effect on O2'- generation during capacitation [2, 17, 56]. At the present time, Sg [89, 90], Zn2+ [56, 90], NO' , and reactives related to the SH/SS couple [56, 101] are the known modulators of O2'- generation. On the other hand, NO' formation is not only regulated by Sg , Zn2+ [56,90], O2'- , and reactives related to the SH/SS couple  but also blocked by inhibitors of PKC, PI3K, Akt, ERK pathway, and PTK . These data, in conjunction with the need of NO' for the whole capacitation period  , could indicate that there is more than one NOS involved. At the membrane level, one would be regulated as the oxidase, by Sg, Zn2+, and reactives directed to SH/SS couple and activated at the initiation of capacitation. The second NOS could be intracellular and modulated by transduction cascades related to capacitation. In agreement with this, one of the phospho-Akt substrate in capacitating spermatozoa is of 140 kDa [3, 102], which is suggestive of NOS, this enzyme being a downstream effector for Akt (see section below). This hypothesis will need further confirmation. Of interest is that the two PKA inhibitors tested (H89 and KT5720) do not affect NO' generation  . In line with this data is that in the signal transduction cascades involved during capacitation the cAMP/PKA axis and the PI3K/Akt pathway seem to act in parallel (see section below) [5, 17]. 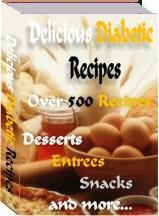 This brilliant guide will teach you how to cook all those delicious recipes for people who have diabetes.